South African cuisine reflects its people perfectly – it’s an exciting mix of cultures, flavours and food traditions from right around the globe. For centuries, people have been arriving here from across Africa and the globe, bringing their own recipes and traditions. From Africa, there are tender meats – beef, chicken and lamb – and fresh veggies – corn, spinach and beans – from the rich soil. Then there’s a touch of fruity, Asian spices thanks to the Malay influence, particularly in Cape Town. And from India, there’s chilli and spice in famous Durban curries. Many European groups have made their marks here, too. The Dutch legacy lives on in cinnamon-infused delights, morning rusks and sweet and savoury pancakes; the British gave South Africa afternoon tea followed by G&Ts and the Portuguese speakers from Mozambique made South Africa mad for peri-peri. As for the French? They brought their winemaking know-how to the southern tip of Africa. While much of South Africa’s fare has traditionally been associated with meat-consumption, there’s loads of vegetarian and, increasingly, vegan, options on offer, too. If there is one aspect of South African food culture that every visitor will encounter, it’s the braai. 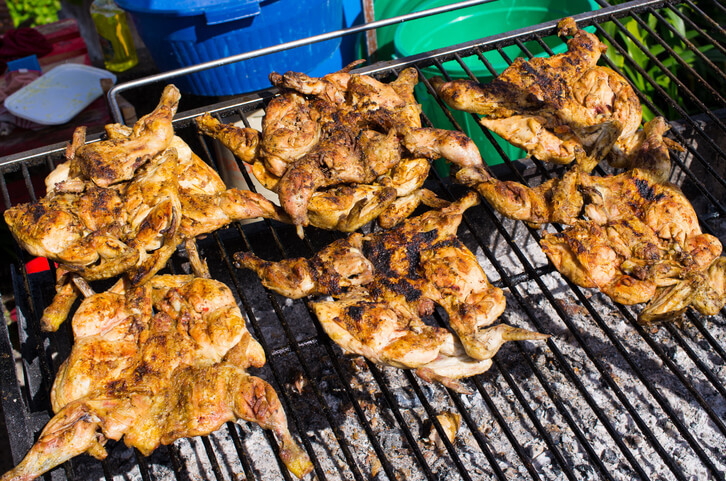 This is Afrikaans for barbecue and it is a firm favourite across all cultural groups. In fact, braaing is so important that the nation comes together each October to celebrate National Braai Day. South Africans will braai just about anything – meats, vegetables, seafood. However, a braai essential is boerewors, a spicy coiled ‘farmer’s sausage’ made from beef, pork, coriander and a blend of spices. 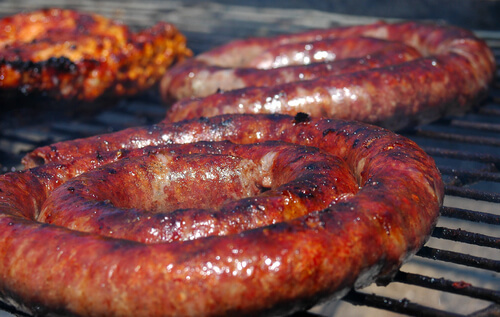 Boerewors is often paired with mielie pap, the South African staple food. Made from maize meal, this starchy carbohydrate is similar to polenta and is frequently served with tomato and onion gravy. As South Africans tend to braai over coals, there’s usually at least an hour between the fire being lit and the fire reaching optimum heat. 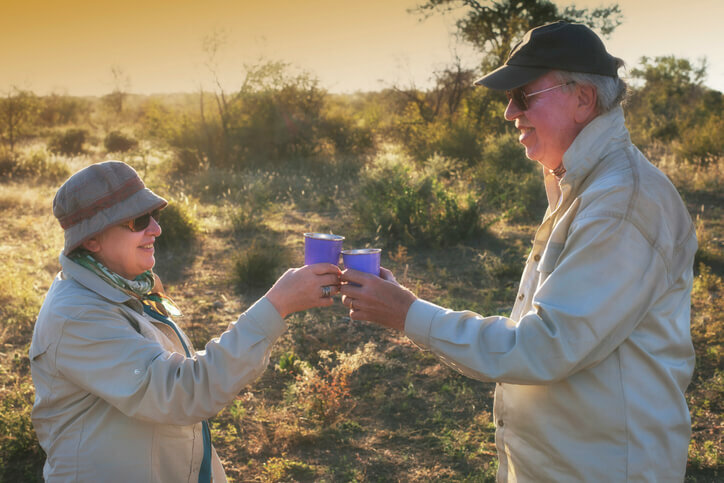 This leaves time for sundowners – the first drink of the evening – which is served as the sun makes its rapid descent toward the horizon (only the Western Cape enjoys long light evenings in the summer months). 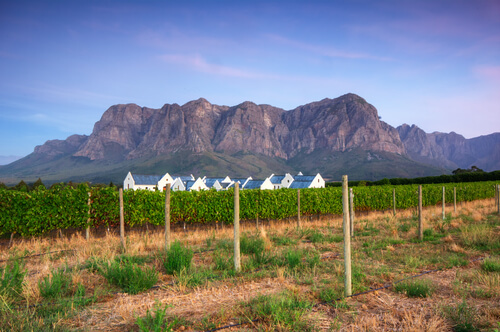 Sample wines from the Western Cape (Chenin blanc and Pinotage are favourite varietals) or, a local brew such as Castle Lager or a craft beer. And you know what goes perfectly with a sundowner? Biltong. 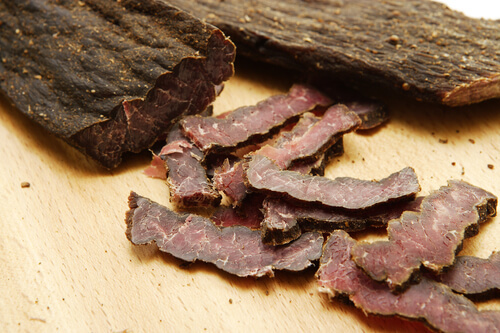 Similar to jerky, this dried meat snack is made from beef or antelope such as impala or kudu. It is salted, rubbed with spices and dried. South Africans typically rise early and visitors on safari are likely to get up before dawn, too. Because of this, start your day with a rusk. Similar to biscotti, these morning snacks are enjoyed dunked in coffee. Other popular breakfasts are porridge, fresh fruits or a traditional bacon and egg fry-up. Lunch could be anything from leafy green salads with a side of peri-peri chicken, savoury pancakes, quiche, soup or maybe, bunny chow. Not what it sounds like, this dish is, in fact, a quarter or half loaf of bread with the middle removed and filled with a spicy veggie or meat curry. 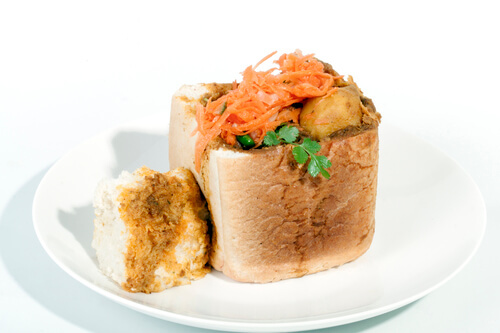 The bunny chow was invented by Indian workers who created it as a way to take their lunch with them to the sugarcane fields of KwaZulu-Natal. Speaking of sugar, there’s no shortage of indulgent puddings in South Africa. 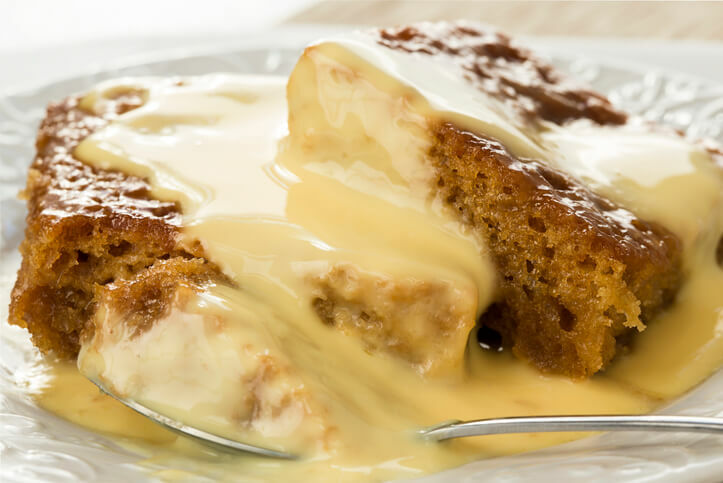 Two favourites are malva pudding, a spongy dessert made with apricot jam and served with custard or ice cream, or melktart (milk tart), unsurprisingly made with milk, pastry and cinnamon. End the evening off with a glass of sweet stoepwyn (veranda wine) or Amarula over ice. This liqueur is similar in style to Bailey’s but is made from the fruit of the Amarula tree – a favourite with elephants who are said to get ‘drunk’ after gorging on the heavenly fruits.